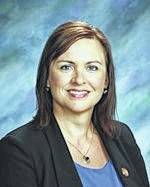 For Angie Pollock and the staff at Big Walnut Local Schools, scoring well on the state report card is good news, but it doesn’t mean the district has reached the summit. There’s always more work to do, she said. The Ohio Department of Education awarded districts and schools letter grades — A through F — in six component areas from the 2016-2017 academic year. The components are Achievement, Progress, Gap Closing, Graduation Rate, K-3 Literacy and Prepared for Success. ODE did not include any new measures on the 2016-2017 report card. The overall district grades will not be released until 2018. Big Walnut Local Schools recorded the following grades in each category: Achievement, C; Progress, B; Gap Closing, C; Graduation Rate, A; K-3 Literacy, B; and Prepared for Success, C.
”Big Walnut improved in just about half of the report card measures — Value Added, (Annual Measurable Objectives), Gap Closing, and K-3 Literacy,” Pollock noted. On the 2016 report card, Big Walnut received an F in Gap Closing and a D in K-3 Literacy. The district recorded the following grades last year in the Value Added categories under Progress: Overall, C; Gifted, B; Lowest 20 Percent Achievement, C; Students with Disabilities, C.
In the Value Added measures on the 2017 report card, the district earned B grades for overall progress and progress among gifted students. Big Walnut scored an A in progress for students in the lowest 20 percent in achievement. The district received a C for progress among students with disabilities. The district’s grades in Achievement, Graduation Rate, and Prepared for Success were unchanged from last year. This fall is an important time for Big Walnut Local Schools. The district has placed a combined bond and permanent improvement levy on the Nov. 7 ballot. According to district officials, the bond is 6.6 mills for a duration of 37 years. The permanent improvement levy is a continuing measure of 1.25 mills. If approved by voters, the funds raised from the measure would pay for construction of a new high school, an additional elementary school, and security upgrades for current school facilities.